A clanger by Hatters keeper Elliot Justham saw Town’s play-off hopes ended with a 1-0 defeat at Southend United this afternoon. With just nine minutes remaining, it looked like Luton would take their changes of a top seven berth into the final game against Stevenage next weekend as they were holding the promotion-chasing Shrimpers. 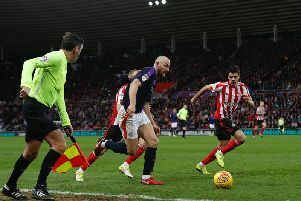 But Justham, who had signed a new two year deal in the week, then somehow fumbled Michael Timlin’s ambitious long range attempt through his legs and over the line, for a hammer blow Town couldn’t recover from. Results elsewhere gives Luton little or no chance of making the top seven now, as Stevenage beat Carlisle 1-0, while Plymouth seeing off Tranmere 3-2, means the Hatters go into the final day needing an eight goal swing to leapfrog Argyle. Prior to kick off, Luton had made one change to the side who defeated Hartlepool, with Nathan Doyle replacing Shaun Whalley. It was John Still’s side who went closest early too, Cameron McGeehan bursting into the box and Elliot Lee took over to sidefoot wide when he should have at least hit the target. McGeehan’s afternoon was then ended early after he took a heavy fall and suffered a nasty blow to his elbow, with Whalley taking his place. Justham reacted well to turn Barry Corr’s backheel away from danger, while he then denied the leading scorer again, clinging on to his powerful header with Luton caught out overloading their left. Whalley volleyed well wide from distance, but Justham was proving the busier of the two number ones, hanging on to Jake Cassidy’s long ranger. Although Luton were being dominated in terms of territory, they did create an opportunity through some lovely football as Cullen dinked through for Whalley whose cross found Howells, whose shot deflected away. Moments before half time, Jonathan Smith gave the ball away in the centre as David Worrall advanced but his shot didn’t worry Justham. After the break, Ben Coker sent a curler into the stands, while Jake Cassidy slid in to reach the full back’s cross but couldn’t direct it on target. Hatters, who had scarcely tested Bentley, almost had a sniff as Howells advanced on the flank, only for the imposing Adam Barrett to beat Cullen to the delivery. Southend then should have taken the lead just before the hour mark as Timlin’s cross was missed by Cassidy, only to reach Corr on the volley, who sent it skywards from close range. The hosts were getting nearer and nearer as Worrall’s searching deliveryfrom the left was met by centre half Barrett who couldn’t keep his header down, while sub Jack Payne was blocked by Luke Wilkinson. However, with 23 minutes to go, referee Iain Williamson made a huge call as Whalley broke away only to be clipped by Coker, with the Southend man shown a straight red to the astonishment of the home fans. Although he was just about the last man, Whalley still had a fair way to go to goal, but after some thought Williamson brandished a red. With a numerical advantage, Luton quickly took the ascendancy, with Whalley in particular behind the best moments. First Cullen was denied by a wonderful block from sub Luke Prosser and after some pinball in the area, Whalley’s curler was only inches wide, with the winger also denued by Bentley after again cutting on to his left foot. The Shrimpers were still a threat though as Justham saved low down from Corr at full stretch, before the moment that ultimately decided the contest, Timlin taking aim and leaving Luton’s keeper red faced. Hatters tried for an instant response, Griffiths’ volley athletically turned over by Bentley, with the full back replaced by Alex Wall in a final throw of the dice. Try as they might though, there was no way for Luton through an unpenetrable Blues defence who have now gone over 12 hours without conceding at home, as they stood firm to move into the automatic promotion places themselves. Blues: Dan Bentley, Ben Coker, David Worrall, Michael Timlin, Barry Corr, Will Atkinson (Luke Prosser 70), Cian Bolger, Ryan Leonard (C), Gary Deegan, Jake Cassidy (Jack Payne 62, Myles Weston 83), Adam Barrett. Subs not used: Ted Smith, Kevan Hurst, Stephen McLaughlin, Joe Pigott. Hatters: Elliot Justham, Michael Harriman, Scott Griffiths (Alex Wall 83), Steve McNulty (C), Luke Wilkinson, Nathan Doyle, Jonathan Smith, Cameron McGeehan (Shaun Whalley 20), Jake Howells, Mark Cullen, Elliot Lee (Luke Guttridge 65). Subs not used: Alex Lacey, Mark Tyler, Lewis Kinsella, Ryan Hall. Booked: Wilkinson 43, Doyle 48, Bolger 71, Deegan 72. Hatters MOM: Shaun Whalley - teased and tested the Southend defence, particularly late on.